Even after three full decades, The Simpsons remain one of the most-watched shows on television. Deep into season 30, the show's newest episode managed to pull in impressive ratings for the Fox network, marking a four year high for the series. A staggering 10.2 million viewers were watching the show live when it aired, with 3.8 million in the coveted 18-49 demographic. The last time the long-running series saw ratings this high was four years ago, which is certainly good news for the show moving forward. The Simpsons had the benefit of a strong lead-in, airing directly after Fox's Sunday night football programming featuring the Philadelphia Eagles against the New Orleans Saints. The ratings boost followed The Simpsons into Fox's other shows in the same block as well. Bob's Burgers pulled in 5.33 million viewers with 2.2 in the 18-49 demo, which is a five year high for the series. Family Guy would then draw 4.18 million viewers with 1.8 rating. This is the best the show has performed in the ratings in a year. The series finale of Rel would also earn 2.8 million viewers with a 1.1 rating, which is the second highest for the season. Perhaps the hilarious couch gag from the beginning of the latest episode of The Simpsons helped keep millions of viewers around for the rest. It featured Avengers: Infinity War villain Thanos sitting on the familiar brown couch in the Simpson family living room, watching their television. Using Maggie's pacifier with his Gauntlet, Thanos turns most of the Simpsons to dust, just as he did to so many superheroes. Only Maggie is spared by the sinister supervillain, and she decides to join Thanos on the couch after the decimation of her family members. It's one of the funniest couch gags to be shown on the series in a while, even if it's a little bit dark. Reportedly, Fox is considering a sequel to The Simpsons Movie, bringing the animated family back to the big screen once again. Additionally, movies based on Bob's Burgers and Family Guy are also in the early stages of development. This recent ratings boost may help to convince Fox that a new movie about The Simpsons would be profitable, expediting the production of the potential follow-up movie. 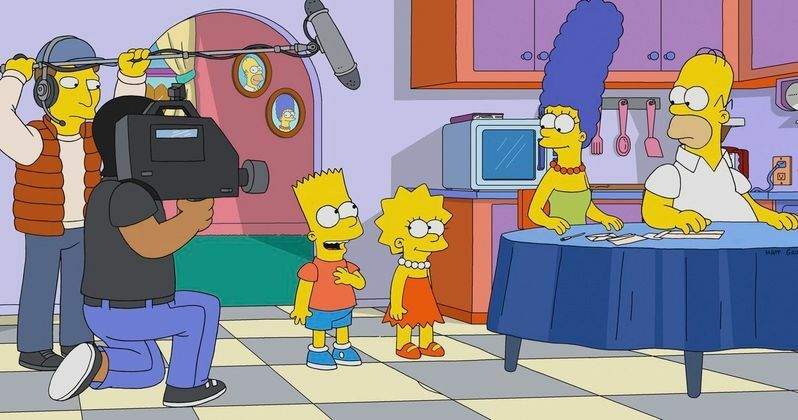 Writer-producer Al Jean and director David Silverman have both previously said that a sequel is possible, and the show's ongoing popularity only helps to make it more likely. The Simpsons is currently in the midst of its 30th season, with new episodes airing Sunday nights on the Fox network. After the ratings jump, it will be interesting to see how many viewers come back again for the next episode. In any case, it's incredible to pull in such high ratings for any series after thirty years on the air, even if the jump is temporary. Already a record-holder for the longest-running American scripted primetime TV series, The Simpsons will always be seen as a legendary fixture in pop culture. This information comes to us from ComicBook.com.